Arya Stark from the 2012 A Song of Ice and Fire calendar. All images by John Picacio. You may not know who John Picacio is by name but, if you’ve been a fan of A Song of Ice and Fire, then you’ve seen his work illuminating the world created by George R.R. Martin’s books. The award-winning illustrator helped define the looks of Jon Snow, Eddard Stark and other iconic ASoIaF characters before casting directors got cracking on HBO’s hit Game of Thrones television adaptation. Picacio’s one of those artists whose work glows with a distinctive and elegant point-of-view. Aside from Martin, his linework has graced works by Michael Moorcock, Harlan Ellison, Joe R. Lansdale and tons of other science-fiction/fantasy luminaries. For the last few years, he’s also been creating Loteria Grande, a re-invented version of loteria, the classic Mexican game of chance. io9 is featuring at some of Picacio’s favorite pieces in honor of Hispanic Heritage Month—including his recollections about the creation of each illustration. I grew up playing a card game with my family. It’s called Loteria, and it’s a Mexican game of chance, played much like Bingo. The icons on the cards are super-familiar within Mexican culture, but I wanted to re-imagine them in my own unique way. ‘La Sirena’ was one of the first of those visions, and she’ll always be one of my favorites because she caused a lot of people to fall in love with my Loteria work. This art ended up winning the 2013 Chesley Award for Best Product Illustration, when it appeared as a limited-run art card. This one is a favorite because I didn’t know I was writing stories in my head until I drew this one. She was the fourth of my Loteria series and when I drew her, I realized I was creating a back story, but I wasn’t writing the words down. So I started jotting down those ideas and bits of story and realized there were stories behind the Loteria artworks I had drawn before her. I went back and wrote those down too. She was the turning point where I discovered there were legends and secrets in the cards and I needed to tell them. I love when I see people cosplay as this artwork. It happens more and more as Dia de los Muertos approaches every year. I grew up surrounded by this imagery, and I wanted to create a facial design that was iconic and unique. When you draw something, you never completely know how the world is going to react, but I thought this one might resonate. In fact, it’s become more popular than I imagined, and I love that people of all cultures have embraced her. Author Jay Lake was my friend and he fought a very public battle with cancer. He blogged about his trials and tribulations until he passed in 2014. Before he did, I asked him if I could use him as a reference model for one of my Loteria artworks called ‘El Arbol’. He knew he was dying, and I wanted to turn him into a tree of life. I’ll always be grateful to him for saying ‘yes’. He was a prolific creator who poured his everything into his pages, and I’m trying to live up to that. I met Leigh Bardugo at a George R.R. Martin party in 2011, and she immediately became one of my favorite people because she was funny and driven. Within a year or so after that, her debut young adult novel Shadow and Bone released and became a smash hit. If you haven’t read that book, you should, and if you have, then you’ll be able to glimpse secrets in the lights and darks of this one. This was the first artwork I created for the 2012 George R. R. Martin/A Song of Ice and Fire Calendar. I’ve always loved the book illustrations of N.C. Wyeth, and one of my favorite things about them is he would illustrate “between the beats” of the story. In other words, he wouldn’t necessarily paint the scene described by the author, but instead he would depict an unspoken moment that lurked between sentences. I tried to capture the spirit of the book’s characters for all of my ASoIaF artworks, rather than just re-interpret George’s words into pictures. When George R.R. Martin asked me to be the artist for the 2012 ASoIaF Calendar, he had signed the deal for HBO’s Game of Thrones, but the show had not aired. At that point, they had yet to start casting and working on pre-production. George insisted that I not look at any of the impending cast announcements related to the show because he wanted a “John Picacio vision” of his book characters. That was perfectly fine with me and in retrospect, I’m glad I didn’t have the show’s imagery in my head when I was drawing. I love Game of Thrones, but for me, it was always about the books and those timeless characters. I drew most of this artwork in a hospital during my daughter’s first hours and days on this planet. 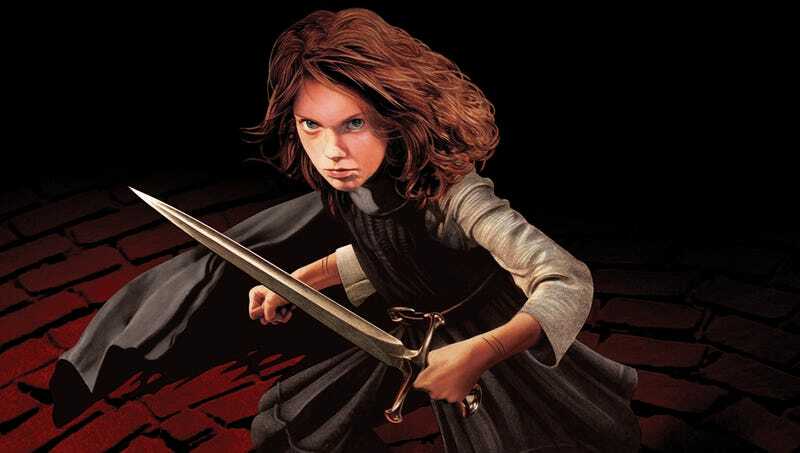 I hoped she would be feisty and strong like Arya, and that wish has been granted a hundred-fold. Arya looks nothing like my daughter, but when I look at this one, it feels like I’m looking at family. Ned was the third ASoIaF artwork I drew for the calendar, and during the early sketch stages, it was clear to me that George and the publisher Random House really liked where this one was going. My art director David Stevenson is always terrific because he’s not heavy-handed and lets artists do their job while he clears the way. I found that George was a great art director in his own way too, as he was part of the approval chain on everything I did. He would say very little, but he was very specific. His notes always made the work better. ‘A little more salt and pepper’ in the beard was his only note here, and I did it, and he was right. This one is an ancient artwork of mine, dating back to 2004. Frederik Pohl’s Gateway is one of the iconic classics of science fiction and Random House asked me to create a new cover for it, after Boris Vallejo’s iconic art had been the cover since the 1977 debut. Even though this is an older work, this one still holds a special place for me because I love the book and I’m glad that the art still remains in print as the cover for so many editions around the world. I’m excited to see how SyFy develops this into a TV series, and I hope they’re able to capture that wondrous sense of the epic and intimate that makes Pohl’s novel so powerful. Michael Moorcock is not just one of my favorite authors, but he’s one of my favorite people. I was asked to do some of the covers for the definitive Random House Elric omnibus series, and this cover was for the sixth and final book. Mike had told me how much he loved American cowboy movie serials when he was growing up in a 1940's London bombed out by Nazi warplanes. Those happy trails were comforting to him in a time of peril—and in a converse way, that became my inspiration for this final cover. Elric is an anti-hero and I thought if this was the final book, then he would not trot lightly into a gentle sunset. When I’m hired to illustrate a cover for a book, I’m looking for strengths and spirit of the narrative. I thought the SF/F cover world needed more dimensional depictions of women, and the book’s protagonist Ruby was the right character at the right time. My vision of her was inspired by author Brenda Cooper’s crisp prose, but also by Rosie the Riveter and Botticelli’s “Birth of Venus.” Because she was a singer, she needed a microphone. Have a closer look at the barrel of that microphone stand that you probably thought was a rifle. Your voice is your weapon. This was my cover for the 60th Anniversary Edition of this literary classic. When we think of this book, most of us know how the basic story goes, even if we’ve never read the original novel. I wanted to create a cover that would make new readers look at this book as the strange and alien wonder it really is — a tale just as resonant today as it was sixty years ago. This is the latest in my series of artworks for Tor.com’s Wild Cards series, edited by George R. R. Martin and art directed by Irene Gallo. I love doing these pieces because I get to experiment a bit and for this story by Melinda Snodgrass, it was aces high. Wild Cards is such a fun universe of characters and crossed lives, and I’m looking forward to doing a few more of these in the coming months. I recently debuted this Loteria artwork and I’m gratified by the initial reaction to her. If you look at the old-time, traditional Loteria artwork for ‘El Valiente’, it’s a venerable macho posture of a man with sleeves rolled up, ready for a fight, while holding a bloody knife. I took this icon in a different direction, and this one is a tribute to my young daughter and to all warrior women everywhere. For those that want her on their walls, you can find her here.